BANGI, 24 November 2014 – Malaysia and some countries in South-East Asia still have a lot of catching up to do before they can even be compared with their neighbours in the northeast such as South Korea, Taiwan and China. Professor Jan Nederveen Pieterse from the University of California, Santa Barbara said there are significant differences in the economies within East Asia despite the region being labelled collectively as the ‘East Asian Miracle’ by the World Bank. Speaking at the 9th Pok Rafaeh Chair Public Lecture here today, Prof Pieterse said although some eight countries – among them Malaysia, Thailand and Indonesia – have been lumped together with their north-east neighbours, there are gaps in Gross Domestic Product (GDP) and income distribution. He is currently Pok Rafeah Distinguished Professor in International Studies at the Institute of Malaysian and International Studies (IKMAS). In his lecture titled What happened To The Miracle Eight? Looking East, 21st Century, the Mellichamp Professor in Global Studies and Sociology at the UC Santa Barbara, explained that similarities such as fancy skyscrapers and multi-lane roads are not enough to determine economic development. If Malaysia wants to escape the ‘middle income trap’ it needs to move away from being an assembler of appliances in light industries employing mostly foreign workers. After 35 years Malaysia has become no better than a low-value added assembly industry where industrialisation has stalled, locked in low-value, low-skilled industries such as electronics which are dependent on low-skilled imported labours, Prof Pieterse said. The limited upgrading in electronics for Malaysia means that it is now exposed to the competitive pressure of China’s export machine and by 1990 China had exceeded Malaysia in terms of all Foreign Direct Investment (FDI) inflows, capturing 9 percent of the world total against Malaysia’s 7 percent. By 2002, China’s share of FDI had increased to 33 percent while Malaysia’s share had dropped to a mere 2 percent. In the nineties all developing countries had been “Looking East” simply because South Korea and Taiwan had been the most successful of the newly-industrialised nations. But since then, no South-East Asian economy has generated any internationally-known industrial brand, with many attempts at heavy industrialisation having failed. Prof Pieterse said in Malaysia ethnic affirmative action plays a key role in trying to address economic imbalances. ‘Nativist redress’, as he called it produced a Malay rent-seeking class in the economy and permeates education and civil society. The one factor which business people say is holding back economic development are the ‘pro-bumi’ policies, he said contending that the “Bumiputra affirmative action has been significant early on but has become functionally autonomous and no longer serves the purpose for which it is was designed. It has also become a tool in the hands of elites, a sacred cow impervious to criticisms, he said. 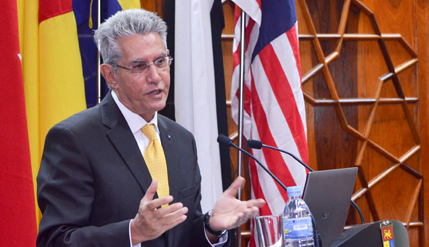 Vision 2020 target of Malaysia becoming a fully developed nation by 2020 is not compatible with the setting up of institutions shaped by ethnicity and religion, Prof Pieterse said. Chairman of UKM Board of Directors Prof Emeritus Dato’ Ir Dr Zawawi Ismail; Deputy Vice-Chancellor (Research & Innovation Affairs) Prof Dato’ Dr Mazlin Mokhtar and IKMAS Director Prof Dr Rashila Ramli were among those who attended the talk. Prof Pieterse is a renowned scholar in sociology and global studies and one of the leading thinkers on globalisation. His current focus is on 21st century globalisation. He was previously at Maastricht University, University of Illinois; Urbana-Champaign, the Institute of Social Studies, The Hague; University of Cape Coast, Ghana and University of Amsterdam. He has also been visiting professor in 14 countries – Argentina, Brazil, China, Germany, France, India, Indonesia, Japan, Pakistan, South Africa, Sri Lanka, Sweden, Thailand and currently Malaysia. He is a prolific author/editor of 21 books and many journal articles. He also co-organises the annual Global Studies conferences.